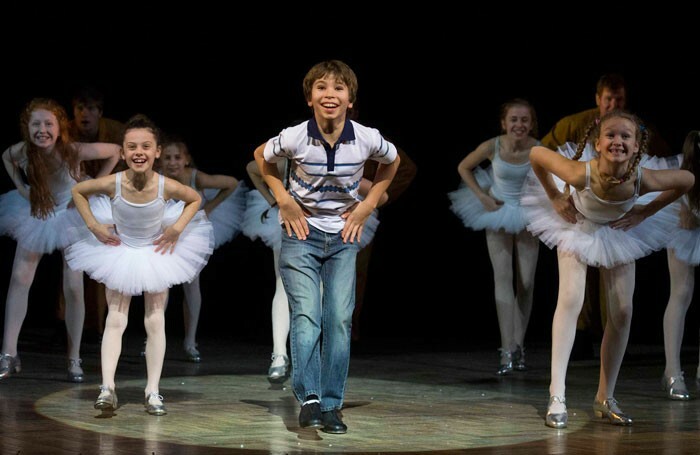 One of the West End’s modern greats, Billy Elliot, is marking it’s tenth year in London and it truly is a celebration. With music by Elton John, the story is now one known by many and thanks to Official Theatre I got the chance to see the show in this special anniversary year. Brilliant seats in the dress circle of the Victoria Palace Theatre and there was even a glass of prosecco thrown in! Set in the eighties at the height of the miner’s strikes, the show follows the life of young Billy Elliot, a 12 year old boy who one day stumbles across a ballet class and discovers a brilliant new talent. Industrial mining clashes with delicate ballet in style in this musical with some beautiful songs to decorate the chaos. In an unfortunate start to the evening, the show started 15 minutes late due to ‘technical problems’ as we were told. These things happen and I’m not entirely sure what the issue was but I think it had a slight effect on the cast. The opening number seemed a little quiet and shaky to me. However ten minutes into the show it seemed to settle and the cast really came into their own. There were several highlights for me, the first of which was Billy himself. Played by Bradley Perret that night, I couldn’t fault him. His dancing was inspiring. He shone during Electricityand I couldn’t take my eyes off him and Barnaby Meredith (Billy Older Self) during Swan Lake. The two worked seamlessly together to produce such a beautiful piece of art. Another standout cast member was Tomi Fry who played Michael. This boy has an amazing natural talent and an organic comedy flair. I absolutely loved his and Bradley’s rendition ofExpressing Yourself. The children really seemed to own this show as I thought the ballet girls also shone. They had a lot of fast-paced, complex choreography to keep up with and they did so with ease while keeping their engaging individual characters. I think the standout adult cast member was Deka Walmsley who played Dad. He portrayed a strong but unassuming father figure who, despite his initial aversion to Billy’s dancing, you really wanted to warm to. When the character does a u-turn you can’t help but warm to him further which has to give testament to Deka’s acting. I enjoyed the clash of themes in the show and the choreography seems to celebrate and accentuate the awkward conflict between industry and the arts. I liked how the scenes overlapped using the two mismatched manners and lifestyles. It was jarring but it managed to work and was clearly proving a point representing the reactions of many male figures towards ballet at the time. I’ve not seen dance and movement presented in this way before and it grew on me throughout the show. As a newcomer to the musical, I didn’t know quite what to expect and although I thought the show was clever something didn’t quite click for me. I don’t think the staging was quite to my taste as I felt it was a bit clunky in places and at times the dialogue wasn’t snappy enough. It was a great show but it didn’t wow me as a whole, which I was expecting after a lot of hype over the years. I would definitely go see it again and I’d recommend any dancer to go and marvel at the choreography. It may not have been to my exact taste and it won’t be one of my all time favourites, but you can’t deny that it deserves it’s place in the West End as one of the greats. Next Post Can the West End Bend it Like Beckham?